The collaborative team-building guidebook that takes Mining Group Gold one step further "Now more than ever before, organizations need to build and maintain a culture of trust and collaboration. 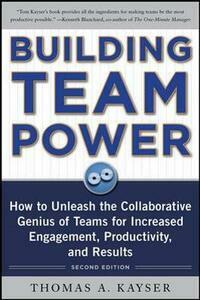 This updated edition of Building Team Power brings Tom Kayser's important concepts to a new generation of leaders. Read this book and take its lessons to heart-you can't afford not to." -Ken Blanchard, coauthor of The One Minute Manager (R) and Lead with LUV "A must-read for individuals wishing to build successful teams in today's complex, highly interconnected, and global environments. Having worked directly with Tom over the years, I can confirm that his principles work!" -Jim Stoffel, Executive Partner, Trillium-Group, LLC, and previously Senior Vice President, Eastman Kodak and Vice President and General Manager, Xerox "A well-organized toolkit of ready-to-use techniques to enable fast, cross-silo, teambased problem solving and value creation-critical new capabilities in our increasingly competitive industry!" -Dr. Jean A. Dames, Senior Manager, Strategic Sales & Leadership Effectiveness, American Express "Tom Kayser is an author worth reading. His book, Building Team Power, is about how to help teams collaborate and win in today's highly competitive marketplace. This is a significant addition to the existing business literature on work team collaboration. Read it and become a better leader." -John Vester III, Principal, Ernst & Young Transaction Advisory Service "Tom Kayser delves into the intrinsic values that unleash the full potential of teams. 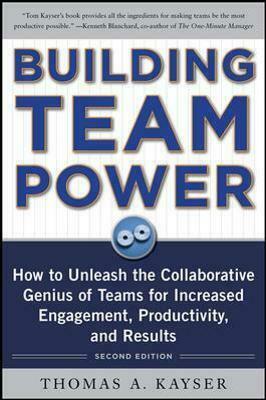 Building Team Power is a must for every leader!" -Rose Fass, Founder and CEO, fassforward consulting group "Building Team Power is to your team what the owner's manual is to your car: the onestop resource for how it works, how to maintain it, and what to do first if it breaks down." -Ed Muzio, CEO, Group Harmonics, Inc.; author of Make Work Great After 30 years at Xerox and in the course of his consulting work, Tom Kayser discovered a major shift in how people work. The old school of rigid "command-and-control" management no longer gets results. To stay productive and competitive in today's world, the key word is "collaboration." By studying and isolating what makes teams succeed in the workplace, Kayser has developed a system of proven team-building techniques that anyone can apply to his or her own group situations. His step-by-step program shows you how to: Solve problems faster, smarter, and better Delegate work more effectively and efficiently Manage conflicts and interpersonal issues Build mutual trust among your people Make wiser decisions at every level Building Team Power is filled with clear examples and powerful exercises to help you put theory into practice. You'll discover seven proven strategies for improving your team, key brainstorming techniques for group meetings, analytic tools for problem solving, and a six-step collaborative model for all occasions. You'll learn how to capture your market, reduce costs, and improve quality by unleashing the untapped, collaborative genius of your people and your teams. You'll find out how to do things right the first time, every time, adding value to your products and services while being more agile and responsive than your competitors. Plus, you'll read a fascinating case study of one company dealing with budget cuts in today's tough economy. This is how you unlock the collaborative power of the people around you.